This week I spoke with Comedian Brian Kiley. 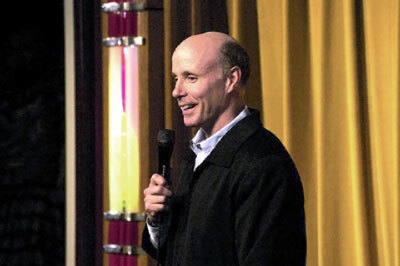 He has appeared on David Letterman, Jay Leno, and worked as a staff writer for Conan O'Brien for 16 years. In this interview we discussed the way Conan O'Brien left NBC, current comedy trends, and the secret to a happy marriage. Andrew: How would you describe your album "self portrait" for those that haven't listened to it? Brian: I would say it is a mix of one line jokes and canned laughter. Andrew: How did you get involved in comedy? Brian: I can remember being 12 or 13 and wanting to be a comedy writer or comedian, but I didn't know how people became comedians. Andrew: So how do you become a comedian? Brian: When I was 16 I started to write down jokes on 3" x 5" cards and saving them because I thought I would need them some day. Then when I was 19 I saw a comedy show at my college, and after the show I spoke with one of the comics and he invited me to this club to watch all the shows I could for free. So I told him that I wanted to be a comedy writer and he told me that I would have to perform because I couldn't make any money writing in Boston. My first thought was I "could never do that." So I came to the shows for a long time, and then I took a summer school class at Emerson that was actually taught by Denis Leary. At the last class we performed and I did well, so they encouraged me to go to an open mic, and I've been doing it ever since. Andrew: So Boston first and then you moved to New York? Brian: Well, I stayed in Boston for a while to develop an act. Boston had a comedy explosion at that time and you could actually make more money there than you could in New York. I would work every little hole in the wall, Elks club, comedy club, bars, restaurants, ballet studios, well, not ballet studios but you get the idea. Eventually, I developed a pretty good act and got on The Tonight Show and then when I got a job with Conan I started doing the club's in New York. Andrew: How were you able to get a staff gig working for Conan O'Brien? Brian: At this point, I had been a comic for 10 years, and I was doing a lot of topical stuff in my act. So much of comedy is by reputation. I was a guy that was writing jokes in the paper every day and I had a couple friends that were hired on Conan and somebody got fired and they were looking for help with the monologue. So they asked me to submit and I actually just typed up 50 jokes from my act. These were the same jokes that were going pretty well at the Elks club and ballet studios. They called me the next day and said "you start tomorrow." Andrew: Do you see any trends happening in the comedy world at the moment? Brian: I have seen a trend of me and my friends out of work. I do think that comedy has gotten dirtier. I think what happened was some of the comedies were getting too predictable, and so now with movies like The Hangover or I Love You Man they are getting more outrageous. Andrew: Do you write out your jokes in advance or do you take a premise on stage and eventually find a punchline? Brian: I'll definitely have the jokes written out beforehand. For me the wording is crucial. I have to have the wording just right. Sometimes I might ad-lib a tag line, and that's not to say there won't be a spontaneous moment, there won't be, but that's not to say that. It just wouldn't work for me any other way, my jokes are very precise. Some comics can be conversational, but I don't like to conversations on or off stage. Andrew: What is your take on having to do the road? Brian: I have started to have to do it again because I am out of a job, but I wasn't able to do it because I was with Conan for 16 years. Although, I did do a little during the strike. It is really hard to do the road with a wife and kids. The nice thing about the road is that you really get to focus on your act. You see new things, you are doing long sets, and you get to work on your act during the shows. Also, during the day you get to honing material and you don't have the distractions. If I am in St. Louis I am not going to random children's soccer games, whereas, when I am home I am going to baseball games or bull-fighting lessons or whatever. Andrew: Let's talk about working for The Tonight Show with Conan O'Brien. What is your take on how everything was handled and ultimately how Conan left that show? Brian: You are breaking up! I can't hear you! Brian: You know I think we're all just ready to move on at this point. I hope that TBS thing works out for everybody and is a great place for Conan to go. I'm just really excited about the new situation. I think that's what everybody is focused on at this point. Andrew: What is the secret to a successful marriage? Brian: I think not throwing things is good. Andrew: What is good or bad about The Comedy & Magic Club as compared to other clubs. Brian: I am glad you asked, there are so many bad things about that club. Honestly, what I appreciate is that the comics that they have just know what they are doing. If I was going to shows, I would just go there. They have such a good combination of funny new comics with funny older comics. I have so much fun in the green room just bantering with other comics and then it's fun to go and watch their acts. Also, you really have to bring your "A" game because you don't want to be the the person that you hear the audience say "they were all funny except that one guy." You don't want to be that guy. I think it's an amazing club. I wish every club was like the way they run it. 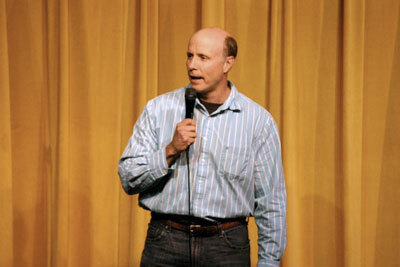 Brian Kiley will be one of the 10 comedians on Saturday, June 26th 2010 at 6:45 pm. Reservations Required. (310) 372-1193 or comedyandmagicclub.com. ER.